Participants helping in the formation of the course included those from the Buddhist, Christian, Ras Tafari, Islam and Sikh Dharam (way of life), with an objective to inspire, educate, train and empower others to deliver Chaplaincy from the heart of faith. The Nishkam Centre became the source for the delivery of the training programme, registering 14 chaplains as students from various faith traditions who took a total of 60 voluntary hours each to complete the course. To enhance the training and better understand Chaplaincy in the 21st Century, Chaplains from Organisations and Faith Communities were invited as speakers. Presentations included insight into community, healthcare, police and prison chaplaincy procedures as well as the latest research in values led approaches. Students had the opportunity to participate in the ‘Forgiveness Charter Reconciliation’ project to further understand and learn about the toolkit and steps to forgive oneself and others to deepen and build on broken relationships. The key elements of the course were to understand faith and organisational policy, procedure, guidelines, ethos, ethics, mandatory requirements, equality and diversity. Cultivating dignity and respect, customer care and understanding the individual faith requirements of chaplaincy from the life cycle of conception, birth, childhood, middle age and old age through to the end of life cycle including all faith celebrations and solemnizations. tion to develop the skillsets of the chaplaincy students they took part in role plays, communication skills, presentation skills and confidence building and an understanding of ‘practice what we preach’, seeing the image of the Divine in all. The participants visited three local places of worship: St Michael’s Church, Central Lozells Mosque and Guru Nanak Nishkam Sewak Jatha Gurudwara all in the Lozell’s and East Handsworth Ward, giving students a better understanding on how religious worship contributes in the healing process of the body, mind and soul. This allowed the participants to have a feel of the spiritual aura around the focal point of each place of worship. A series of personal statements and evaluations where also captured as project evidence. Mike Anderson the Quality Advisor for Open College Network recently examined the student files and was very pleased with the achievements by the students and level of commitment by the Nishkam Centre. On Friday 29th July 2016 senior members of Santander visited the Nishkam Centre to present a cheque for £5,000 from the Santander Foundation. This was a great opportunity to share information and better understand each other’s organisation. The Santander Foundation is at the heart of the bank’s community activities, providing grants to small charities and social enterprises working with disadvantaged people to fund skills, knowledge and innovation projects across the UK. The grant will enable the Centre to upgrade the Information and Communication Technology (ICT) suite and to provide essential services. Ravinder Singh Sidhu, Branch Director from the Financial Centre in Birmingham and Branch Manager, Harry Singh Saggu, visited the Nishkam Centre to meet with Amrick Singh, Nishkam Centre Director and Narinder Kaur, who developed and submitted the application. The meeting enabled the two organisations better understand each other’s priorities and activities and to discuss future collaboration. The grant was awarded by the Santander Foundation to upgrade the Nishkam Centre’s ICT suite. Opening the meeting Amrick Singh offered thanks on behalf of the Board, the team at the Nishkam Centre and all beneficiaries for the support Santander had provided to the Nishkam Centre. The Nishkam Centre prides itself on the services that it provides, in particular those that are provided free at the point of use. The influx of mature and sometimes non-English-speaking people, with limited computer skills who wish to learn how to use a computer, has presented a challenge for the centre with the ageing equipment. The grant will allow disadvantaged people to achieve basic knowledge and up-skill individuals in the use of computers. Having the skills and access to IT will allow people to become self-sufficient in form filling, carrying out job searches and applying for jobs. Learning how to shop online will also enable individuals to make better use of their, often limited, funds as they will be able to buy goods more competitively and shop around for services such as utilities. Having Ravinder and Harry present the cheque to the team at the Centre was a fantastic opportunity for the Santander team to better understand and appreciate the work of the centre. During the meeting the Santander team were impressed with everything the Nishkam Centre was doing to make a difference to the lives of the local, regional and international communities. They were particularly interested in how the Nishkam Centre, a Sikh inspired organisation that is sometimes misconceived to be only for the Sikhs / Punjabis was engaging with so many diverse communities across Birmingham. Amrick Singh took great pleasure in explaining to the visitors the significance and ethos that underpinned all the activities that the Nishkam Centre and the Nishkam Group undertakes. He articulated the importance and significance of understanding the brand, ‘Nishkam’ – which literally translated means selfless service to all without expectation of reward or recompense. Both Ravinder and Harry were also impressed by the diverse variety of activities that were undertaken by the small team at the centre with the support of many volunteers yet managed to reach out to so many in a super-diverse city. Ravinder Singh and Harry Singh were delighted to have a tour of the upgraded ICT suite after the cheque presentation and buffet lunch, giving them the opportunity to observe the results of the funding and some of the learners who benefitted. After the meeting, Amrick Singh said, “It was inspiring to meet like-minded individuals from an organisation that was keen to work with community groups, charities and the third sector to see how they could support activities. It would be very difficult for us as an organisation to self-finance all the activities that we do and still offer them to those disadvantaged and deprived without the support of partners who enable us to provide the services that we do. Our parent organisation Guru Nanak Nishkam Sewak Jatha (GNNSJ) has always stood by us and supported us in our time of need, and it is the support of other organisations like Santander who visited today, and all the other partners that have funded us in the past, that we have a great debt of gratitude. “The meeting was very positive insofar as it enabled us to have a conversation around Santander’s charitable activities and some of the challenges the Nishkam Centre and other partner organisations were facing regarding grants. I must say we look forward to working with organisations like Santander to see how we continue to support the disadvantaged communities that we work with and serve. To look at Tarlok Singh Virdee is your average 60 year old from Leicester’s Sikh community. However, the Nishkam volunteer is prone to taking on something quite extraordinary be it weightlifting, cycling, donating or pushing his body to the limit. The year has been difficult for him and his family with the loss of two of his brothers Salinder Singh and Jasbir Singh. In memory of his brothers, he is participated in a 130 mile Sikh Arts and Cultural Association (SACA) Charity Bike Ride. The funds raised will provide a home from home for families of children and young people with cancer on-site of the Queen Elizabeth Hospital Birmingham. SACA Charity Bike Ride from Birmingham to London is testing and gruelling and Tarlok is asking friends, family and the public to donate to this fantastic cause. Having successfully completed the ride last weekend, he is keen to raise maximum funds for a great cause. Tarlok Singh is no stranger to punishing himself; he took part in last year’s bike ride. The whole event then raised over £71,000 for the Children’s Radiotherapy Ward at Queen Elizabeth’s Hospital Birmingham. SACA, a 100% volunteer charity organisation is the main organiser of the event – over the years it has ensured the need for safety and improvements. In 1984 a group of 14 aspiring youths decided to establish a challenge that could help both local and national children’s charities. They considered a number of sporting events that would test both their determination and personal fitness. They also considered the key element of working as a team and supporting each other. The challenge would require endurance, fitness and careful planning. They set the standard for what has now become a yearly summer event lasting 2 days. The Birmingham to London cycle ride now attracts riders from all over the country and international riders each year and involves months of planning and adherence to safety management disciplines. Last year, with the relentless effort from riders, a staggering £71,173 was raised for the Queen Elizabeth Hospital Children’s radiotherapy ward. This year, the money raised by the SACA Charity Bike Ride 2016 will be used to fund a ‘home from home’ in association with Queen Elizabeth Hospital Birmingham for families of children and young adults receiving cancer treatment. Every year a children’s charity is selected as the ride’s beneficiary. Over the last 31 years, the ride has raised in excess of £450,000 in aid of different children’s charity groups. The Teenage Cancer Trust Young Person’s Unit at the Queen Elizabeth Hospital is for 16-24 year olds and has 11 in-patient beds and a day-care facility. The first unit in Birmingham was built at the Queen Elizabeth Hospital Birmingham in 2000 as one of the first Teenage Cancer Trust units in the country. This amazing unit was updated and re-provided in May 2011 when the new hospital was built. Tarlok Singh said, “The Nishkam Centre and Guru Nanak Nishkam Sewak Jatha (GNNSJ) are always supporting charitable causes here in the UK and abroad. I respect the Chairman Bhai Sahib Bhai Mohinder Singh who encourages us all to participate in charitable and benevolent acts. I took part in this two day bike ride on the 16th and 17th of July to raise as much money as I can to help fellow human beings. The ride started from Birmingham (Smethwick) and proceeded through Coventry, Daventry and through Milton Keynes taking in the picturesque views of our British countryside. It then reached its centennial milestone in Luton where there was an overnight stay. The ride continued in the morning, in Luton and passed through St Albans, Radlet, Elstree and Harrow before reaching its final destination to Southall in West London. On Friday 4th December, Dr Omnia Marzouk, International President of Initiatives of Change (IofC) accompanied by Elsa Vogal and Bill Ozanne visited the Nishkam Group of Organisations. This auspicious visit has paved the way for fruitful collaboration opportunities that will benefit humanity for generations to come. On arrival to the Gurudwara Sahib and campus Dr Marzouk and the distinguished guests were welcomed and greeted by the Nishkam Centre Director, Amrick Singh. An overview of the activities that took place at the Gurudwara and the other four centres was given. 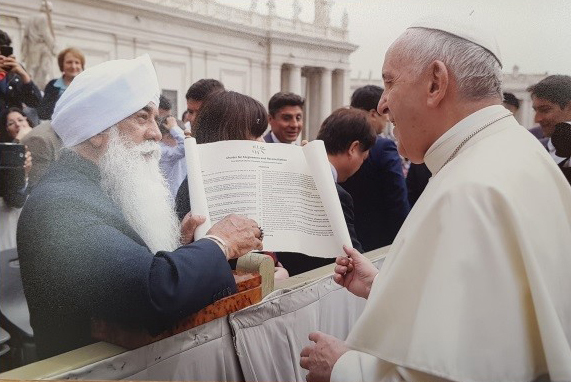 At this point a linkage back to Kericho (Kenya) and the work of the founder Saint, Sant Baba Puran Singh Ji and his successor Bhai Sahib Norang Singh Ji was also highlighted. The guests were intrigued to hear the journey and development of the Jatha and the contribution being made to humanity. at the Gurudwara since 1974 and over 25,000 meals a week were served in the langar (blessed vegetarian food prepared by volunteers in the Guru’s kitchen and served to all). It became clear and evident to the guests that whilst structurally there were much larger Gurudwaras in the UK, GNNSJ was one having a big impact and involvement. The guests then made their way into the main Darbar Sahib to pay respects to Sri Guru Granth Sahib Ji, the eternal and revered Guru of the Sikhs. Dr Marzouk was invited to present a bouquet of flowers to Sri Guru Granth Sahib Ji. After visiting the Darbar Sahib the group made its way to the Gumbad Darbar or referred to as the Dome Prayer hall. The guests were clearly in ore when they got to the rooftop and took in the amazing views and unique presence of the dome. The history of the construction, decoration and completion of the dome was shared with the guests. The guests were then taken for a brief walk on Soho Road to see the other enterprises. They visited the outside of MSS, spoke about the pharmacy, looked at and discussed the Nishkam School Trust where Ranjit Singh provided an overview for the guests so they could appreciate the amount of work, in particular, the volunteer hours, the unique vision and the leadership that had been invested for the benefit of future generations. Once they reached the Nishkam Centre they all visited the current exhibition and the Harmandir Sahib model – or referred to as the Golden Temple in the western world. The group were overwhelmed by the beautiful model and the work that had been done on the 24 Spiritual and Moral Dispositions that was also exhibited. Bhai Sahib Bhai Mohinder Singh, Chairman of GNNSJ and the Nishkam Civic Association, joined the delegation in the seminar room. After brief introductions Bhai Sahib Ji asked Dr Marzouk about the meaning of her name and her ancestral background. There then ensued a series of discussions around similarities between to two institutions. Bill was keen to draw parallels between what the Nishkam Group was involved in and what the IofC was doing. “If we were to map the areas of the world where there is conflict and then also map the areas of the world where greenery is being destroyed and becoming desert the maps will show a relationship. Where there is conflict there is also desertification [land becomes desert like]. We have to look at our dialogue tools to help communities to work on the land to improve the productivity of the land. The conversation around Kenya was of particular interest. The work GNNSJ was doing with education, healthcare provision, women’s prison work, sports facilities, orphanage work, HIV work, and general empowerment with ethics and values was something Dr Marzouk could relate to and she gave examples of projects they too were involved in. This involved faith communities coming together following trust building workshops over a period of time. This led nicely into a conversation around the Charter of Forgiveness and Reconciliation that Bhai Sahib Ji was leading on. Bhai Sahib Ji spoke about ensuring our moral compasses were aligned right, “That should be our priority. Our different identities, mother, father, brother, sister etc need to be fulfilled and should not detract us from our purpose here on earth. We should be compassionate as being revengeful is double poison.” He then recalled the story of Guru Arjan Dev Ji. “The 5th Guru who was made to sit on a hot plate and had hot sand poured over his head, he gave us an example of how we should live in God’s will. The Guru’s friend and soul mate, Sai Mia Mir, a Muslim, wanted to help him but was told that this was God’s will. We can and should nurture good human beings with good values. We must bring out the best in people not the worst”. The group then shared a blessed meal together at the Gurudwara where further heartfelt conversation took place. There was a general sense of anticipation and hope of what was possible by collaboration and partnership working. It was inspiring to see the inspirational and visionary leaders of two organisations in such harmony and agreement of what was required to make the world a better place for all who inhabit it and for mother Earth per se. Bhai Sahib Ji then presented Dr Marzouk with an information pack and more importantly a copy of a book that both pictorially and narratively explained about Sikh heritage, faith, practices, places of worship and in general painted a picture of what is a Sikh. During the day Dr Marzouk was asked about her role and she humbly said,” My predecessors were very important and influential statesmen, the former head of Red Cross Switzerland, Kofi Annan’s personal assistant, and Rajmohan Gandhi. I had turned down the role and told them to find someone more important and relevant. When other candidates refused the job on the grounds they could not it, they pressed me to take it on. After prayer and reflection, three questions came to me. ‘Do you believe ordinary people are used by God can do great things?’ I thought ‘yes’. The next question was, ‘Do you think God is calling you to do this?’ Again I thought ‘yes’. Finally ‘Are you prepared to leave your comfort zone?’ to which again I answered ‘yes’. It was at this point that I took on the role in all honesty. After the event, Bill Ozanne said to Amrick Singh that, Omnia (Dr Marzouk) and Bhai Sahib Ji seemed to have a great meeting of hearts and minds and this was probably because of their shared journey’s and similarities of how they got their calling to serve and took on the challenges they are addressing. After the visit, Amrick Singh said, “It was a pleasure and honour to welcome our distinguished guests to the campus and share with them what we are privileged to do. I am sure we will be identifying collaborative opportunities here and abroad to work more closely together. We will also be seeing more of Elsa Vogal, she was part of the French Resistance and recalls phenomenal episodes where she was face-to-face with the enemy and lived to tell the tale. More importantly, she used her experience to help shape the world we see today by becoming instrumental in what IofC was all about”. A delegation from the Nishkam Group of Organisations was invited to The Phoenix Newspaper 5th Anniversary Gala Dinner and Awards Ceremony at Bethel Convention Centre to mark the newspaper’s achievements on Saturday 5th December 2015. The black tie, red carpet event was sold as it was marketed as ‘the event to be seen at for 2015’. network and photographs as guests arrived and made their way down the red carpet. The Nishkam Group attendees were respected Bhai Sahib (Dr) Mohinder Singh Ahluwalia, Chairman of Guru Nanak Nishkam Sewak Jatha (GNNSJ) and Nishkam Civic Association, accompanied by his wife, Mrs Baldev Kaur, Mr Sewa Singh Mandla, and Nishkam Centre Director, Amrick Singh and his wife Sharanjit Kaur. Some 500 guests made their way to their tables to enjoy the meal and speeches. The Nishkam table as well as the Nishkam attendees also had Neena Gill, the MEP for the West Midlands, Ninder Singh Johal the current President of the Black Country Chamber of Commerce (BCCC), member of the Greater Birmingham and Solihull Local Enterprise Partnership (GBSLEP) and his wife. Ninder took the opportunity prior to dinner being served to congratulate Bhai Sahib Ji on receipt of his OBE and the Papal Knighthood he received. Gurudwara, had returned to the UK especially for the awards ceremony. The Bishop came to say hello to Bhai Sahib Ji and they had a quick catch up. Another VIP that came to say hello to Bhai Sahib Ji was Mykal Brown, who was the other person who had a coin dedicated to him in Handsworth along with Bhai Sahib Ji and Merrise Crooks-Bishton. During dinner there were performances from Community Gospel Choir, Ronald Dewit and Melika Queely. After dinner speeches from a number of invited Guest Speakers including Bhai Sahib Bhai Mohinder Singh OBE, Keith Stokes-Smith and Olusegun Dosumu. Bhai Sahib Ji started by welcoming everyone to the event and congratulated Marcia on a great achievement. He also took the opportunity to promote key messages about values and virtues, community cohesion, the media being used in a positive means as opposed to promoting negative attitudes. and collaboration it should build on the existing 24 moral and spiritual dispositions that were created for the Birmingham RE syllabus in 2007. The media should share our understanding of religion and cultures and its coverage should be more frequent and consistent when covering interfaith events. Media should promote peace; it is peace that we all want; individual peace, family, community peace and global peace”. This comment received rapturous applause from the audience. “Every person has a responsibility to respect life. No one has the right to injure, to torture or to kill another human person. This does not exclude the right of justified self-defence of individuals or communities.” Once again, this received a round of applause. “I feel humanity has to revisit and resuscitate this Declaration of Human Responsibilities”. Bhai Sahib Ji’s address was followed by Keith Stokes-Smith, Chairman of Birmingham Commonwealth Association. He reiterated many of the messages delivered by Bhai Sahib Ji and suggested that people take more responsibility for their actions. 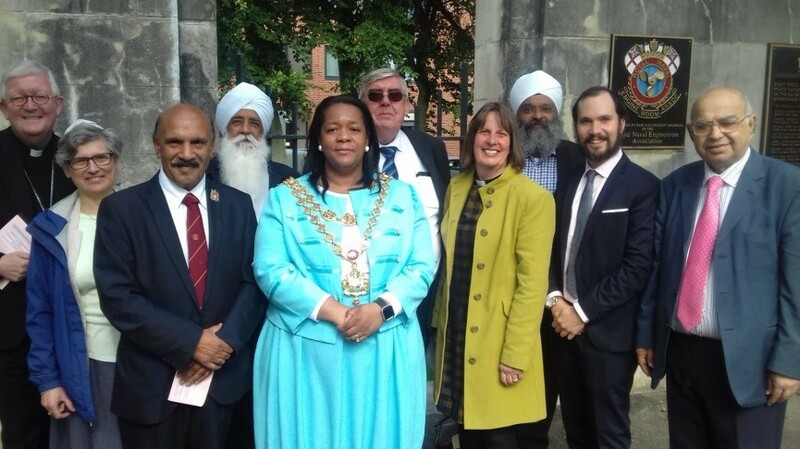 He also went on to say that the Phoenix was a great friend and ally of the Birmingham Commonwealth Association, congratulated them on their achievements over the last five years and wished him well for the next five years. Once the guests had enjoyed dinner, they were shown into the auditorium which could accommodate up to 4000 people. Following the Dhol Blasters, Gospel Central, with Mark Dwayne and Sticky Toffee Dancers entertained the guests and set the scene for the awards. The audience was then presented with a series of performances and guest speakers presenting their thanks and gratitude to the Phoenix and in particular Marcia for her dedication and commitment. achievements and contributions. GNNSJ was a nomination for the ‘Best Place of Worship’ award. A surprise award not listed in the program was made by Marcia McLaughlin when she called Ninder Johal to announce a special award. He came on stage and said that the award was in recognition of the great contribution to Humanitarian Services. He then began to read key bullet points from Bhai Sahib Dr Mohinder Singh OBE’s biography. At this point he invited Bhai Sahib Ji on to the stage to collect his award to a great round of applause from the audience. Musical First at the Nishkam Centre gets full house – Sangeet Baithak attracts admirers! Attendees attentively listen as the concert begins. On Saturday 28th November music lovers from many parts of England gathered to enjoy an evening of Indian classical performances at the Nishkam Centre. This event was held to support students – the next generation of artists – and build a platform for their future musical careers. This was the Nishkam Centre’s first Sangeet Baithak. Sangeet is a Sanskrit word for music, and Baithak is a social gathering, usually with everyone sitting on the floor. approached. Performers were setting up and tuning their instruments, while attendees waited patiently to take their seats. The Nishkam Centre sitar students, tutored by professional Sitarist Roopa Panesar, student of world renowned Sitarist and educationalist, Ustad Dharambir Singh MBE, were first to take centre stage. Nishkam Sitar students Jaswir Sandhu, Mohammed Bashir, Wasim Hussein, Ishani Mackan (Leeds), Fait Punia (Leeds), Basant Bhogal, Beena Mehay-Bennett, Gurmukh Singh Chandan, and Naam Kaur Deogan captured the attention of the audience as they played in Raag Bimpilasi with mesmerising and well-rehearsed confidence and ease. The next performers – Tabla Trio Jeevan Singh, Bhavanjot Singh Rehal, and Prabhjot Singh, students of Sri Bhupinder Singh Chaggar (disciple of late Pandit Sharda Sahai) came from Leeds to perform. There were repeated periods of applause from the audience as their individual and collective tabla cycles became increasingly intricate. Tremendous feedback received from the audience was both uplifting and inspiring. Kaviraj Singh (Santoor) and Pritpal Singh (Tabla) performing. During a short interval attendees were able to network and exchange views about the performances. After the intermission a sitar performance – this time a solo – by Akash Parekh, another Nishkam Centre student of Roopa Panesar was enjoyed by all. He was accompanied by Saheb Singh (Student of Pritam Singh) on tabla. Akash captured the emotion that the playing of a sitar can instil. Akash Parekh, student of Roopa Panesar playing a Sitar solo. The night ended with a professional performance by Kaviraj Singh Dhadyalla. Kaviraj Singh captured the heart of the audience with a Santoor and singing performance. He was accompanied by Pritpal Singh Rai on tabla (student of late Pandit Sharda Sahai and Sri Bhupinder Singh Chaggar). The sound of the Santoor was emotional and left a feeling of spiritual bliss in the air as the concert came to a close. The Leeds “Tabla Trio” performing in front of a delighted audience. Future concerts are already in their initial planning stages, keep checking the Nishkam Centre website for updates. During a landmark trip to the UK to strengthen trade and investment links with the Kenyan diaspora and in particular with Guru Nanak Nishkam Sewak Jatha (GNNSJ) and the Nishkam Campus, His Excellency Iasaac Ruto, the Governor of the County Government of Bomet, Kenya came to the Gurudwara. He had one prayer – to improve the lives of those in his county with assistance from the Sikhs. The visit saw the Governor come to visit Birmingham’s Sikh community for the first time having heard and seen the great work that GNNSJ had already done in the neighbouring county of Kericho. GNNSJ has worked very closely with the Kericho county governor and local assembly to improve the lives of many Kenyans. Working with Prof Paul Chepkwony, GNNSJ and the Nishkam Campus have undertaken many projects in Kericho County. The projects have included the building of an educational institution Nishkam Sant Puran Singh Institute (NSPSI), running medical camps, building a vocational training centre, building a HIV clinic, supporting an orphanage, working with the women’s prison to provide educational facilities, and play facilities for young children with their mothers in prison. We have also seen inward investment from Accenture and Aston Villa Football Club to build sports facilities for the youth across several towns. with the collective will of making things better for future generations. Bomet County Government has the major towns namely: Bomet Town, Sotik Town, and Longisa, Mulot. Governor Ruto’s visit started with a visit to the Darbar Sahib (Guru’s Court / Main Prayer Hall) were the Governor offered a bouquet of flowers to Sri Guru Granth Sahib Ji, the eternal Guru of the Sikhs. The tour then involved a visit to the Gumbad Darbar (Dome prayer hall), where the visitors were left speechless by the sheer beauty and tranquillity of the sacred space. The distinguished delegation then learnt about the Nishkam Community Cooperative, Nishkam Health Centre, Nishkam School Trust, and the Nishkam Civic Association. The message that the governor clearly got was one of self-reliance self-sufficiency, self-help and the ‘welfare of all’. He also comprehended the power of Nishkam volunteering and strong visionary leadership. The delegation was honoured to meet with Bhai Sahib Bhai Mohinder Singh, Spiritual Successor of GNNSJ and Chairman of the Nishkam Civic Association (NCA). Bhai Sahib Ji reminded the Governor and guests about the contribution that his predecessors and founder of GNNSJ had made to Kericho. There then followed a conversation about the importance of education, particularly the provision of good values based education for nursery and primary school ages. The Governor informed all present that he was working on a project to create greater transparency in Kenya by reviewing the constitution and looking at greater devolution. It was a memorable moment when it was revealed that the main driver behind the devolution thinking and design was actually a school colleague of Bhai Sahib Mohinder Singh. His Excellency then thanked Bhai Sahib Ji, for sharing his wisdom with the guests. He recognised that heritage, culture and traditional values were the cornerstone of everything he and his team had seen at the Gurudwara. He said, “The contribution of the Sikhs in Kericho is phenomenal and I am proud to work very closely with Prof Paul Chepkwony.” He went on to say,”Bomet and Kericho are twin sisters as they used to be one county until they were split. I have seen what your organisation has done in Kericho and today I have seen what you do here. Your compassion, humility sense of duty help me to understand why you do what you do. I wonder why the governors in Kenya cannot apply what you are doing here? There is plenty to go around and share for everybody we need to overcome the greed and serve people”. Bhai Sahib then shared a story from Nelson Mandela’s funeral, “The leader of Malawi said you must love your people and your people will love you. This was such a powerful message about leadership that we can all learn from”. The governor shared some personal details about cancer affecting his family. As a result, supporting those with cancer had become a personal passion. In general, he welcomed health and well-being programs and also outlined what his county was already doing to help people. “We offer health insurance, support the elderly with payments, provide medical facilities, provide parental training and classes and also helped young females into education”, he said. Bhai Sahib outlined his vision to have a world-class university in Kericho. Details and discussion was left to Prof Pal Singh, who is the Pro-Vice Chancellor of Portsmouth University clearly understood the challenges of establishing the University. He articulated to the guests that the University should be able to offer degrees from established universities anywhere in the world without the students having to leave their families or their homeland. He said one of the biggest costs and burdens on most families to get their children educated was the cost of relocation, travel, and living away from home. If we reduced these costs we could reduce the burden on families and provide the highest level of education. Ethiopia working on the development of an international world-class business school. This would provide further expertise and knowledge to the Nishkam team when developing a university with esteemed partners around the world. The governor welcomed the discussion and said he would love to be partners in such an undertaking and ideas were exchanged on how this program could be started. The consensus was to start small and to develop the degree programs over a period of time. Overall the meeting was very positive and productive. The governor and his team were under no illusion of GNNSJ’s capacity to be a valuable partner that could mobilise similar projects to those undertaken with success in Kericho County. The GNNSJ team were keen to iterate that the success in Kericho County was down to collaboration between various partners including commitments from the County Governor. On Saturday the 21st of November the Nishkam Centre hosted a “Parliament Week” event to raise the awareness amongst young children, students and adults from the Sikh community in Birmingham. The aim was to get people to engage with the democratic processes at local, national and European level whilst identifying the barriers holding them back. The event began with a meet and greet over light refreshments in the conference room, this allowed conversations to flow and the guests to interact with one another in a warm and welcoming atmosphere. Vice Chair of the Nishkam Civic Association (NCA). Prof Pardesi, who is currently part of an international team helping to set up the first international Business School in Ethiopia at Addis Ababa University, was passionate about engaging the audience and the broader Sikh community in the democratic process. Under the banner of Parliament week, a series of events were organised which included the Saturday event and also an event at the Nishkam Primary School on the Friday. This set the scene for the address by Bhai Sahib Bhai Mohinder Singh OBE, Spiritual Leader of Guru Nanak Nishkam Sewak Jatha (GNNSJ) and Chairman of NCA. The address was inspirational and iterated the importance of being a good human and first and foremost, having good values. Bhai Sahib was passionate about ensuring everyone understood the importance of good values and ‘the gold standard of being a good human being’. He reminded everyone to embrace good values in everything we do. “It is important that our youth are empowered with good values so that whatever profession they go into they will be good workers, good leaders, and good ambassadors”. He also stressed that, “A good human being would always be a good citizen but a good citizen may not necessarily be a good human being”. Bhai Sahib gave a challenging address to allow attendees to think deeper about the Sikh history and politics. “When Guru Nanak Dev Ji came on the scene in 1469, there was chaos – it was a time of political unrest. Throughout the 239 years that Ten Sikh Gurus were on this earth, their main goal was to teach us to be good human beings. Therefore, Sikh Dharam came up as a faith consisting entirely of values. “From 1797-1840, under the rule of Maharaja Ranjit Singh Ji, Sikhs had their own kingdom. However, Maharaja Ranjit Singh Ji was clever, and never involved Sikhs in politics. In politics, you find a double standard; it’s unfortunately a dirty game of numbers. Sikhs had values and therefore would not cheat and lie. When Maharaja Ranjit Singh Ji passed away, Sikhs did not know how to govern as they had never been involved in politics. realms of a 49/51 equation – 49 people voting can be right, however 51 can overrule them. Does this seem right? This is what is occurring and this is what keeps good people away from engaging in politics. Hendrina Quinnen, Councillor for Lozells and East Handsworth Ward gave an overview of her background and why she became a councillor. She also spoke very passionately about engaging with the local community and why she wanted to serve them. Gurdail Singh Atwal and Narinder Kooner, Councillors for Handsworth Wood, inspired the youth to engage in local democracy and how it can affect their day to day lives. They spoke about how you can make a change and gave examples of some of the current changes they are hoping to make. Gurdail Singh encouraged and motivated, in particular the young Sikh community, to be more involved and explained how the Sikh community is under represented and its implications. He gave an account on his inspirational journey into local government. Neena Gill, Member of European Parliament for the West Midland spoke of what members of UK and European Parliaments do. She stressed the need for greater representation of ethnic minorities in national and European government. She also offered to give young people the opportunity to shadow her in the European Parliament in Brussels. We will certainly be following this up in the coming months. Surinder Singh, Electoral Participation Officer at Sandwell Council spoke on how local government works and how local citizens are represented. To conclude the speakers, Councillor Narinder Kaur Kooner addressed the guests briefly to invite more participation from the BME communities. She went on to specify how we can get involved in politics. She said, “Politics influences our daily lives more often then we realise – for example, there are policies that determine what our children learn in schools. There are many ways to get involved in politics, without actually having to become an MP or Councillor. You can become a member of the political party you are supporting a political party. This way, you can vote on specific policies that are being passed, rather than just for the party in power”. The event closed with a question and answer session inviting audience responses to “What is stopping the Sikh community from engaging in local and national government?” Questions such as; how do you feel about the Sikh community being represented, what is the best way for you to be involved, and how can you be more proactive, were discussed. The responses of the questions were collated on Post-It notes and handed in. We are hoping to have the information ready in the near future to share and disseminate with interested parties. The responses will also inform future engagement opportunities so that the barriers can be overcome and promote more participation in the democratic process. Amrick Ubhi, Nishkam Centre Director, gave a vote of thanks to all the speakers, the organisers, Bhai Sahib Ji for the pearls of wisdom, and importantly, all the attendees for their attendance and valued participation. Amrick also invited the audience to become more proactive rather than responding to invitations all the time. He said it was our duty to get involved in governance be it a school, community events, politics and ward meetings. He went on to say that it is not only Bhai Sahib Ji’s role to represent the community at civic engagements but that we must all do our part. The event was a great success and raised a lot of interest within the community. The intention is that many more events of this kind will be organised in the future.